NETWORK FINALS: The WINTER OLYMPICS didn’t change in final Wednesday ratings. Elsewhere, the reruns of THE GOLDBERGS and AMERICAN HOUSEWIFE both lost 0.1. CABLE HIGHLIGHTS: NBC Sports Net’s WINTER OLYMPICS coverage peaked with its late-night telecast at 0.97, which also topped Wednesday cable. CNN’s gun control TOWN HALL led cable news at 0.71/0.91/2.9M, over MSNBC’s RACHEL MADDOW SHOW at 0.35/0.48/2.7M, and Fox News’s HANNITY at 0.27/0.50/2.7M. On TLC, MY 600-LB LIFE gained 0.09 to 0.42, and the return of DR PIMPLE POPPER was at 0.29. ESPN’s COLLEGE BASKETBALL doubleheader was at 0.36/0.32. MTV’s CATFISH rose 0.05 to 0.34. On ID, HOMICIDE CITY premiered at 0.33, and SEE NO EVIL returned at 0.32. On HGTV, PROPERTY BROTHERS jumped 0.13 to 0.32, HOUSE HUNTERS grew by 0.07 to 0.26, and HOUSE HUNTERS INTL was up 0.06 to 0.25. Food Network’s GUY’S GROCERY GAMES rose a tenth to 0.32. 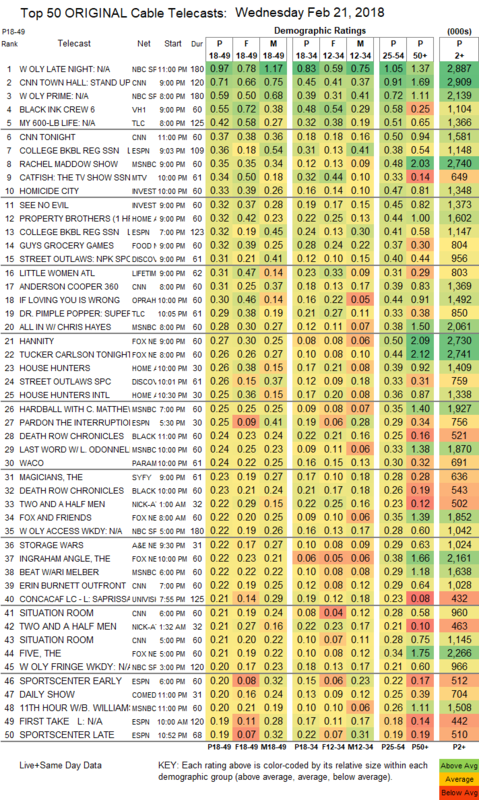 Discovery aired 2 hours of STREET OUTLAWS specials at 0.31/0.26, compared to 0.24 for last week’s episode. On Lifetime, LITTLE WOMEN ATLANTA returned at 0.31. OWN’s IF LOVING YOU IS WRONG lost 0.04 to 0.30. The second installment of BET’s DEATH ROW CHRONICLES was at 0.24/0.23. Paramount’s WACO was down 0.04 to 0.24, but on the other hand gained 0.05 on CMT to 0.09. 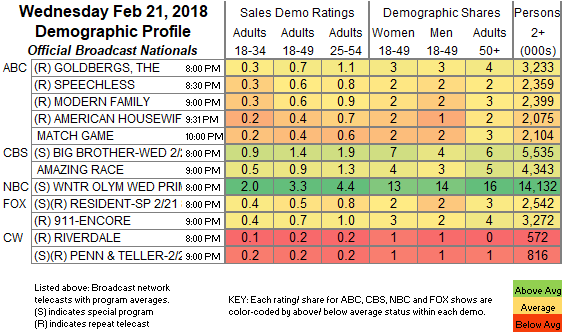 On Syfy, THE MAGICIANS dipped 0.03 to 0.23, and CHANNEL ZERO ticked up to 0.10. A&E’s STORAGE WARS was at 0.22, and ROOSTER & BUTCH ticked up to 0.10. Comedy Central’s CORPORATE lost 0.02 to 0.13. POP’s SCHITT’S CREEK grew by 0.03 to 0.08, while LET’S GET PHYSICAL stayed microscopic at 0.01/62K.